Fab Hull - Fun! Fun! Fun! The 18-foot RS is part of Four Winns' Horizon series of performance runabouts, and it offers recreational boaters an enticing combination of elbow room, big-water ride and towing power. Key to this boat's performance is Four Winns' proprietary second-generation Stable-Vee hull. With this design, a variable-deadrise hull combines wave-cutting deep-V performance at the bow with wide-hull lateral stability at the stern. Reverse chines keep the ride dry and provide crisp turns, while stepped pods on the aft section of the hull provide lift and improve planing performance at low speeds. Register with Boatshed to see 61 extra photos of this Four Winns 180 Classy! Great Performance! Pulling Power! 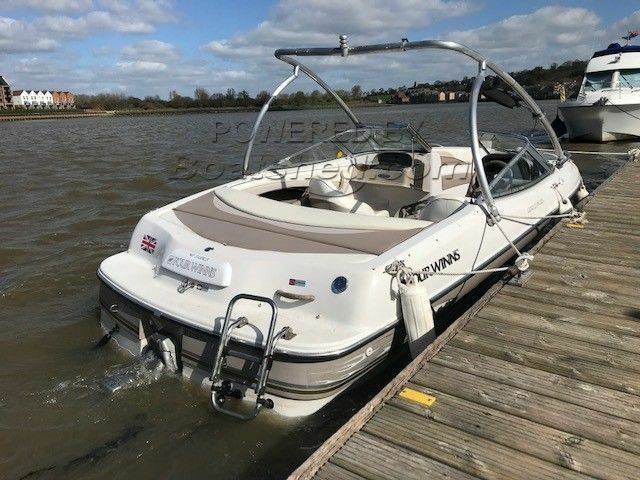 If you like sports cars and lots of fun, water skiiing and sunbathing then this classy bow-rider is going to tick all the boxes. A lovely example of the Four Winns Horizon RS. It gets better - engine overhauled (3K spent) you will be able to blow your friends away with the fantastic perfomance that this superb deep V hull delivers, She will accommodate 7 people comfortably. She also benefits from a full cockpit cover and a complete overhaul on the engine & exhaust system with thousands spent in the last month. She appears to have had light use in her life with a fantastic looking hull & also never being anti-fouled Early viewing recommended. This Four Winns 180 Classy! Great Performance! Pulling Power! has been personally photographed and viewed by Jamie Nash of Boatshed Medway. Click here for contact details.